Annalee Doll Description: Last one. Annalee Museum Doll. Museum tag sewn in side seam #805. 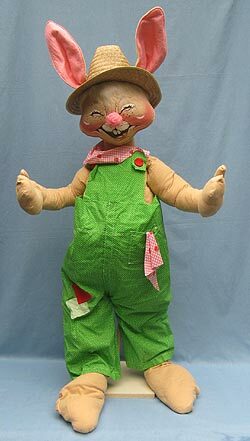 Closed eyes, open mouth with two teeth, straw hat, green and white dot overalls, wooden stand. Item 157087 - the 48" Carrot looks great when he holds it. Companion is D70-82.